The term “evidence-based medicine” entered the lexicon in 1992.1 Proposed by a group of academic physicians as a new way of teaching the practice of medicine, it was based on their belief that a paradigm shift was occurring, from “intuition, unsystematic clinical experience and pathophysiological rationale” to an emphasis on “evidence from clinical research.”1 Nearly 10 years later, it is time to explore the role of evidence in the daily practice of primary care and to reflect on that paradigm shift. This paper reports family physicians' views on the application of evidence in caring for patients with cardiovascular disease in the context of community practice. We sought to gain additional insight, in the Canadian setting, into family physicians' current perspective on evidence and its influence on their daily practice, as part of a larger study exploring cardiovascular recommendations. This study was approved by the Research Ethics Committee of the Queen Elizabeth II Health Sciences Centre in Halifax. Nine focus groups were conducted throughout Nova Scotia, 3 each in rural (population less than 10 000), semi-urban (town; 10 000 to 50 000) and urban (more than 50 000) settings. Family physicians were eligible to participate if they had practised in their community for more than 1 year and were confident that they had sufficient patients with cardiovascular disease to allow them to discuss the topic thoughtfully. We used criterion sampling10 to ensure an appropriate mix of men and women and of those in earlier and later stages of their careers. Of the 76 eligible physicians approached, 50 (66%) participated in the focus groups (Table 1). Eight groups ranged in size from 4 to 9 participants; in one instance, because of the small pool in that rural locale, the interview was conducted with just 2 participants (Table 1). Participants were paid an honorarium consistent with the Medical Society of Nova Scotia fee schedule. 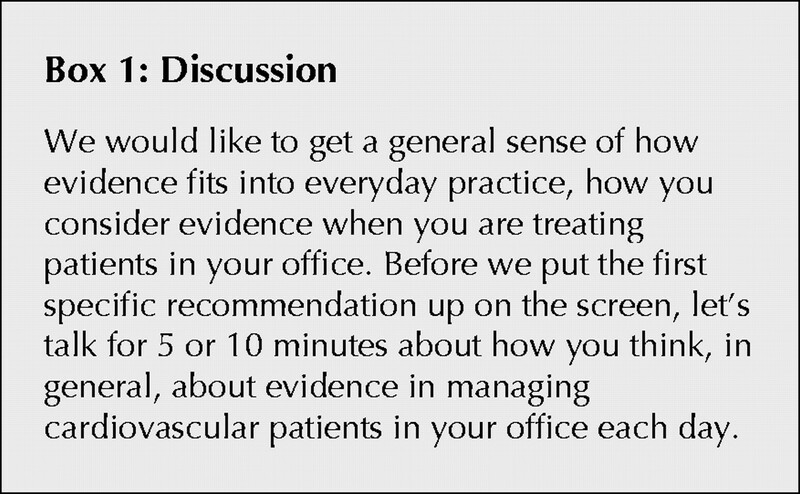 We convened the groups to discuss specific recommendations published in a cardiovascular consensus statement that were relevant to primary care.11 Initially, to place the specific recommendations in a broader context, participants were asked to discuss the use of evidence in their day-to-day practice (Box 1). This “discussion starter”12 yielded particularly rich findings, which are presented here. Eight of the sessions lasted approximately 2 hours, and the 2-person session was 1 hour long. Each session was facilitated by a physician investigator (W.P.) and comoderated by another team member. The researchers who were present debriefed and reviewed field notes after each session. Audiotapes were transcribed within 48 hours and reviewed by the researchers as soon as available, to clarify any muffles or add other contextual information felt to be important for later analysis and interpretation. This mode of dealing with the transcripts enabled the researchers to reflect on each session before conducting the next one and permitted newly identified or rich topics to be probed in subsequent focus groups. Each transcript was read independently by members of the research team, who identified key passages for further consideration. Two of the team members (W.P. and P.L.T.) then compared and contrasted their emerging ideas and developed larger conceptual categories. The other researchers (F.I.B., L.A.J. and J.L.C.) critiqued and confirmed these preliminary categories. Disagreements were resolved through team discussion. We also actively searched for disconfirming examples. Numerous categories were created and revised to accommodate the data adequately. The agreed-upon categories became the basis of a coding structure within QSR NUD*IST, software designed to facilitate textual analysis.13 All of the transcripts were coded by one team member (P.T. ), who sorted preliminary categories into larger themes, which were then checked by other team members for accuracy and to ensure that the spectrum of experience was represented. Our analysis was guided by grounded theory methodology.14,15,16,17 This approach is excellent for examining complex social realities, such as the application of evidence in family practice. Specifically, this approach helped to reveal the varied and interesting ways in which family physicians in our study thought about evidence-based medicine. Two major themes, each divided into 3 subthemes, emerged from the data. The theme of evidence in the clinical encounter had 3 subthemes. The first of these was evidence-mindedness (Box 2A). Participants told us in a variety of ways that they think about evidence during the clinical encounter much more now than even a few years ago. Some considered evidence helpful for clinical decision-making and for explaining treatment options to patients. Evidence was described as replacing a “belief system” based on some combination of what was taught in medical school and learned later through experience, from colleagues and through continuing medical education. 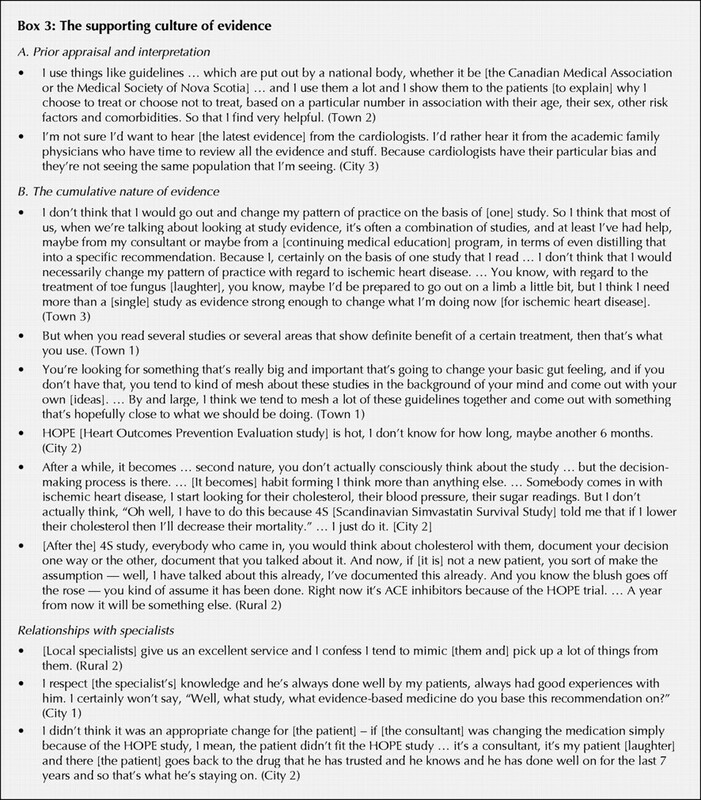 Other factors influenced discussions of evidence, including the ability of patients to understand research information, the magnitude of the benefit or harm of the suggested change, the existence of comorbidities that might influence the decision, the life circumstances of the patient and, finally, past experiences between the patient and the physician. The third subtheme was the changing nature of evidence (Box 2C). Such changes, particularly new evidence leading to changes in treatment or management, prompted a range of responses among participants. Changing management goals, the introduction of new medications or the publication of new clinical practice guidelines could create confusion or uncertainty for some patients, but they also presented physicians with opportunities for discussion. The consensus was that such changes must be dealt with sensitively for a subset of patients including, but not limited to, patients who prefer alternative remedies and those lacking financial resources or drug plans. One participant recounted that when he was in training, β-blockers were contraindicated for patients with heart failure, whereas they are now recommended therapy. In the case of changing guidelines on lipid levels and changing indications for angiotensin-converting enzyme inhibitors, a particular problem is that the change proposed may apply to “asymptomatic” patients. In this situation the doctor must use “new” evidence to convince the patient to change approaches based on “old” evidence, for a patient who is experiencing no symptoms of illness that would seem to warrant such change. The second theme emerging from the focus groups, the supporting culture of evidence, also comprised 3 subthemes. The first subtheme was prior appraisal and interpretation (Box 3A). Participants reported that they had limited time to read and review individual articles. Therefore, they valued evidence when it was part of a practice guideline produced or endorsed by an independent professional association, especially if the recommendations demonstrated an understanding of the context of primary care. There was wide variation in participants' perception of their own critical appraisal skills, from having almost no understanding to clearly demonstrating their ability to interpret study results and consider applicability to individual patients. The cumulative nature of evidence (Box 3B) was the second subtheme. Participants commented that it typically takes more than one study to change behaviour related to vital issues such as cardiovascular diseases, even though most studies are not remembered individually or by name. Small studies become “meshed” together in the minds of physicians, and once this occurs, changes in behaviour may result. There are important exceptions, such as “4S” (the Scandinavian Simvastatin Survival Study)18 and the HOPE (Heart Outcomes Prevention Evaluation) study,19 which on their own can affect practice if they address important patient outcomes, such as death. The physicians remember these studies by name and cite them to patients, noting what the evidence means to that particular person's care. Whether the evidence is cumulative or obtained from a single, high-impact study, the dominant view of focus group participants was that particular issues remain in the forefront of consciousness for a limited time frame. The physicians think of the evidence each time an appropriate patient is seen, for up to approximately 6 months. After that, it is applied when relevant for patients who develop the clinical condition, but by then the evidence has become a “habit” or engrained as “orthodoxy,” its origins less clear. The third subtheme was relationships with specialists (Box 3C). Participants valued trusted local specialists as both sources of new evidence and interpreters of that evidence. Family physicians in our study represented a variety of perspectives in relation to specialists, from taking a relatively passive approach (“mimicking” specialists) to having a more active stance vis-à-vis specialists' advice. We believe that our findings are relevant to both producers of evidence and practising clinicians. In addition to studies demonstrating that particular evidence is incorporated into practice,20 our study offers a macro-level perspective on the place of evidence-based medicine in family practice. To our knowledge, these are the first research data to indicate that Canadian primary care physicians are incorporating evidence-based medicine into their daily encounters with patients, even if they are not fully embracing it. Examining both the obstacles and the opportunities for the application of evidence provides important clues to providers of evidence-based information of interest to primary care. These family physicians recognized that specialists promulgate and interpret evidence, and are particularly attentive to whether evidence is relevant to their practice population. At the same time, evidence-based medicine might empower family physicians to make alternative choices for their own patients by giving them the skills to discuss or challenge specialists' decisions. A spectrum exists among family physicians, ranging from uncritical reliance on specialists' advice to rejection of that advice on the basis of their own interpretation of the evidence. Individual physicians may also take different approaches in different situations. Our findings raise several questions. Do all clinicians require critical appraisal skills or is a system for peer appraisal at both the national and local levels a more promising model for fostering the application of evidence? What is the most effective way to convey difficult risk–benefit statistics to patients so that they can make well-informed decisions about their own treatment? Finally, do patients find the discussion of evidence helpful, meaningful and empowering, or do they find such discussions esoteric and obfuscating? This inquiry was limited to evidence pertaining to cardiovascular disease, which is both plentiful and strong, and hence our findings may not be applicable to other clinical problems. Another limitation is that our study focused on clinical encounters with patients; we did not fully pursue whether family physicians considered the role of evidence in framing consultants' decisions and advice. Further inquiry is needed in different contexts and for different clinical conditions to develop the ideas generated by this study. Decisions about the application of evidence in primary care settings are highly complex, shaped by such diverse factors as patients' understanding of and interest in their own health, comorbities, individual physicians' use and understanding of current evidence, and the changing nature of evidence itself. This conclusion supports the balance emphasized by the Evidence-Based Medicine Working Group itself.23 A key point is that not only is the evidence that might be used in the family practice setting complex, but it may be contested by patients who have different goals or who wish to pursue different paths in their health care. Our findings suggest that any debate about the completion of the paradigm shift toward reliance on evidence needs to account for the realities of primary care and for particular clinical content. Contributors: All authors contributed to the conception and design of the study, the interpretation of data, the critical review of drafts for important intellectual content, and final approval of the version submitted. Wayne Putnam, Peter L. Twohig, Frederick I. Burge also participated in acquiring data and drafting the article. Acknowledgements: We wish to thank the family physicians who willingly contributed their experience in the focus groups. We also acknowledge the expertise of Natalie Dawson, whose meticulous transcription of the interview tapes was essential to our analysis. The study was funded in full by an operating grant from the Medical Research Council of Canada (now the Canadian Institutes of Health Research). Evidence-Based Medicine Working Group. Evidence-based medicine: a new approach to teaching the practice of medicine. JAMA 1992;268(17):2420-5.
van Weel CV, Knottnerus JA. Evidence-based interventions and comprehensive treatment. Lancet 1999;353:916-8. Rosser WW. Application of evidence from randomised controlled trials to general practice. Lancet 1999;353:661-4. Culpepper L, Gilbert TT. Evidence and ethics. Lancet 1999;353:829-31. Mant D. Can randomised trials inform clinical decisions about individual patients? Lancet 1999;353:743-6. McColl A, Smith H, White P, Field J. General practitioner's perceptions of the route to evidence based medicine: a questionnaire survey. BMJ 1998; 316 (7128):361-5. 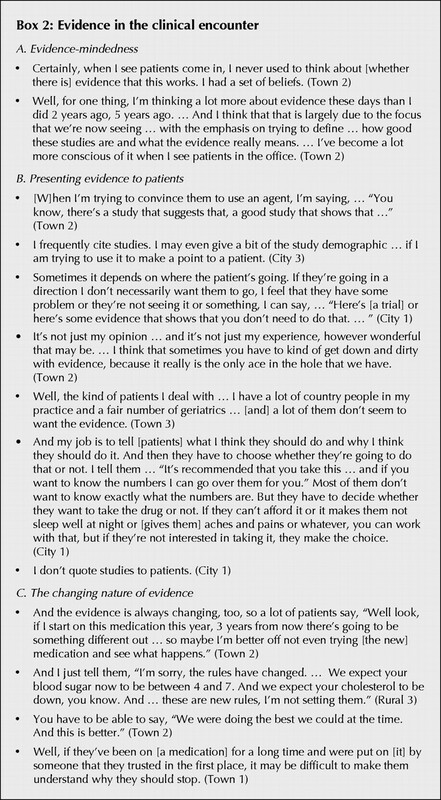 Mayer J, Piterman L. The attitudes of Australian GPs to evidence-based medicine: a focus group study. Fam Pract 1999;16(6):627-32. Gupta L, Ward JE, Hayward RSA. Clinical practice guidelines in general practice: a national survey of recall, attitudes and impact. Med J Aust 1997; 166: 69-72. Fairhurst K, Huby G. From trial data to practical knowledge: qualitative study of how general practitioners have accessed and used evidence about statin drugs in their management of hypercholesterolaemia. BMJ 1998; 317 (7166): 1130-4. Patton MQ. Designing qualitative studies. In: Qualitative evaluation and research methods. Newbury Park (CA): Sage; 1990. p. 145-98. Canadian Cardiovascular Society. 1997 Consensus conference on the evaluation and management of chronic ischemic heart disease. Can J Cardiol 1998; 14 (Suppl C):2C-23C. Morgan DL. Conducting and analyzing focus groups. In: Focus groups as qualitative research. Vol. 16 of Qualitative research methods series. 2nd ed. Thousand Oaks (CA): Sage; 1997. p. 45-64. QSR NUD*IST [software]. Version 4. Melbourne, Australia: Qualitative Solutions and Research Pty Ltd; 1996. Glaser BG, Strauss AL. The discovery of grounded theory. Chicago: Aldine; 1967. Glaser GB. Theoretical sensitivity. Mill Valley (CA): Sociology Press; 1978. Strauss A, Corbin J. Basics of qualitative research. Newbury Park (CA): Sage Publications; 1990. Heart Outcomes Prevention Evaluation Study Investigators. Effects of an angiotensin-converting-enzyme inhibitor, ramipril, on cardiovascular events in high-risk patients. N Engl J Med 2000;342(3):145-53. Risdon C. CyberSearch. Quick clicks to answer clinical questions. Can Fam Physician 2001;47:1183. Guyatt GH, Haynes RB, Jaeschke RZ, Cook DJ, Green L, Naylor CD, et al. Users' guides to the medical literature XXV. Evidence-based medicine: principles for applying the users' guides to patient care. JAMA 2000;284 (10): 1290-6.